Customer Trust or Action: Which Is Better For Your Results? 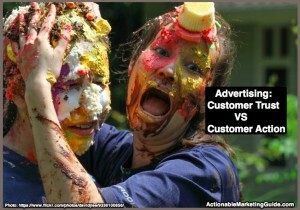 For your advertising plans and budget, does customer trust or customer action yield better results for your business? Think like a marketer not like a consumer. Remember: Even if you use your company’s products or brands, your actions aren’t representative of your target audience. Do you trust your marketing gut? If you’re like many marketers, your gut feel isn’t always the best indicator of actual customer behavior. Good news: You don’t have to guess. Note: Nielsen used online research. The research didn’t measure total users because they didn’t reach offline-only media consumers. To put this research in perspective, let’s look at how marketers buy advertising by media platform in US. 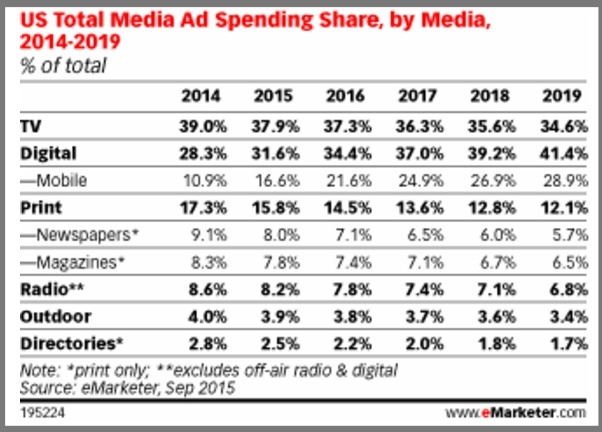 Digital advertising will surpass offline media by 2017 based on eMarketer forecasts. Mobile is where the growth is. US adults spend 2 hours and 51 minutes per day on non-voice activities on mobile devices; of that, 1 hour and 31 minutes are spent on mobile phones. Do your potential buyers trust your advertising? Customer trust is about trusting the information the customer gathers, not your brand reputation according to Patrick Spenner and Karen Freeman in To Keep Your Customers, Keep It Simple. Buyers want information about the reviewer’s decision criteria and product or brand usage. In addition to rating and review sites like Yelp and TripAdvisor, buyers use a variety of related resources. For example, teen haul videos, a trend that’s been around since 2007 to spotlight purchases and related feedback. 8 out of 10 global respondents (or 83%) trust recommendations from family and friends. They’re the hardest to influence since they may not be visible or trackable. 7 out of 10 global respondents (or 70%) trust branded websites. You control your website and blog content and experience. For more information read Content marketing trumps advertising. 2 out of 3 global respondents (or 66%) trust online consumer opinions. You need to monitor ratings and reviews on sites like Amazon, Yelp and TripAdvisor. Respond where appropriate. Almost 3 out of 5 global respondents (or 56%) trust emails they signed up for. Skip the push emails and email list rentals. Customer trust of offline media advertising remains strong, exceeding trust of online advertising options. 6 out of 10 global respondents (or 63%) trust television advertising. 6 out of 10 global respondents (or 60%) trust newspaper advertising. 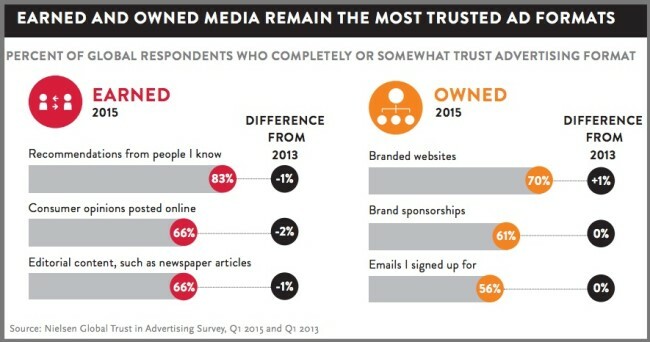 6 out of 10 global respondents (or 58%) trust magazine advertising. Unlike other media ad formats, TV still delivers 85%-90% unduplicated reach where each audience member only sees the ad once according to Nielsen. Use a mix of online and offline media to maximize your unduplicated reach. Customer trust of online media including mobile advertising remains low. 5 out of 10 global respondents (or 48%) trust online video advertising. 5 out of 10 global respondents (or 47%) trust search advertising. 5 out of 10 global respondents (or 46%) trust social media advertising. Here’s how to use social media advertising. 4 out of 10 global respondents (or 42%) trust banner advertising. 4 out of 10 global respondents (or 43%) trust mobile display advertising. 4 out of 10 global respondents (or 36%) trust mobile text advertising. 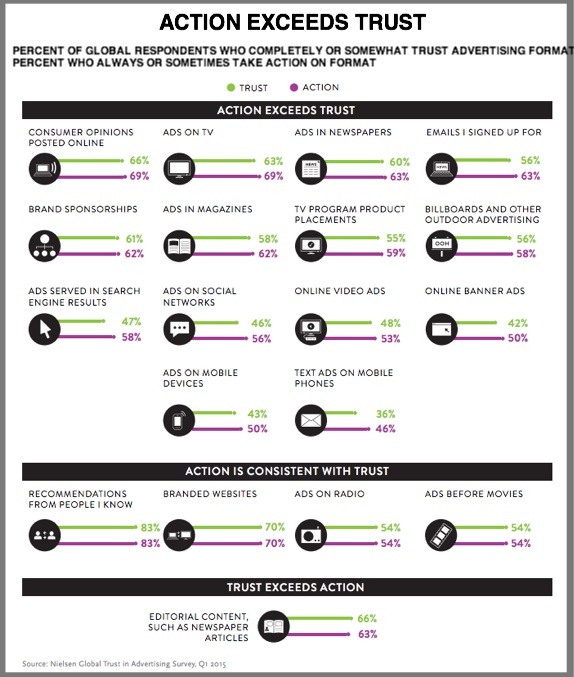 Interestingly video, search and social media advertising options have similar levels of trust. While consumers hate banner ads, it’s surprising they’re not viewed as less trustworthy. This may be attributable to banner blindness as defined by UX expert Jakob Nielsen. Target your audience where appropriate and possible. Always use advertising targeting online. Get audience guarantees for online advertising. This is critical to make sure your ad reaches its intended audience. 50% of digital ad impressions aren’t viewable. Even less trusted ad formats get some potential buyers to the point of purchase. While it seems counter-intuitive, online customers take action regardless of their trust of the media platform. This activity may be attributable to being available at the right time with the ability to complete a transaction. Note: Customers reported their own trust and activity to Nielsen; action post advertising wasn’t tracked. Customer opinions influence buying decisions. Family/friends’ recommendations: 83% of respondents trust them; 83% of respondents take action. Customer opinions: 66% of respondents trust them; 69% of respondents take action. Branded websites: 70% of respondents trust them; 70% of respondents take action. Emails: 56% of respondents trust them; 68% of respondents take action. 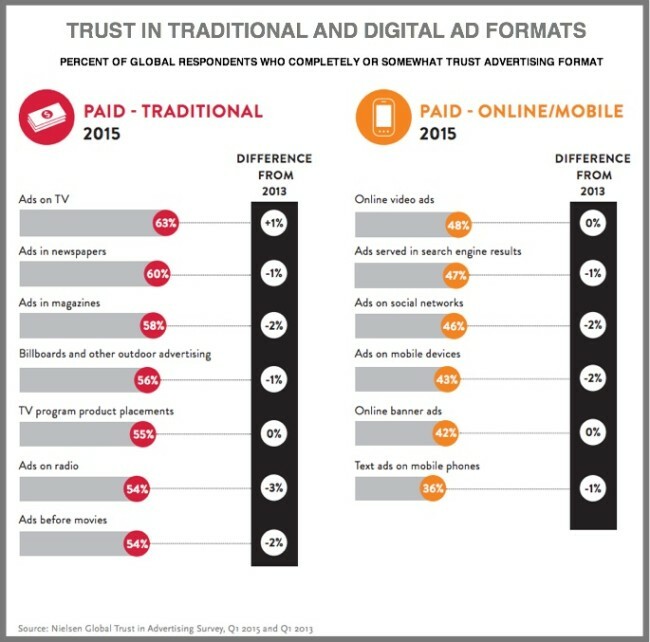 Online and mobile paid advertising gets people to act at a higher rate than their trust level would imply. Search engine ads: 47% of respondents trust them; 58% of respondents take action. Social media ads: 46% of respondents trust them; 56% of respondents take action. Online video ads: 48% of respondents trust them; 53% of respondents take action. Mobile text ads: 36% of respondents trust them; 46% of respondents take action. Ad targeting is important on digital media, especially mobile options. Timing and relevance make a difference in terms of the ad served and the platform where it’s served. Use ad-targeting capabilities where available. Refine your marketing personas. Incorporate findings from your advertising to gather more data about your prospects. Create targeted landing pages. Don’t just send prospects to your home page or a registration form. Where appropriate use software like Unbounce and track results. Use targeted advertising to support and increase your content visibility. The bottom line for advertising, you have to balance customer trust vs customer action. Match your advertising metrics to your KPIs. Don’t measure things that don’t help achieve your business’s goals. Resolve customer problems ASAP. Only 4% of customers will complain to you. They’re more likely to complain to family, friends and social media. Work with employees and other areas of your business to train them and give them the power to fix customer problems. Encourage customers to spread the word about your products. Give customers a positive reason to talk about your brand and products. Build your own media base including your website, blog and email. Owned media gains customer trust and moves potential buyers closer to purchasing from you. Support your content with ads. Use targeted online advertising were appropriate. Which advertising formats do you use in your marketing plans? Which is more important to you—customer trust or customer action—and why do you think so? 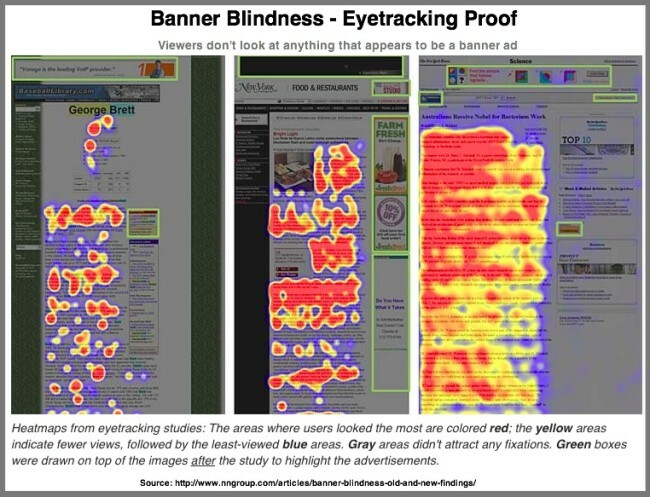 Tags Banner Blindness, Chart, Earned Media, eMarketer, Infographic, Nielsen, owned media, Research, teen haul, Unbounce. Bookmark the permalink.